R. Fontvieille, La Dynastie des Hache, Grenoble, 1974, p. 87. Jean-François Hache (1730-1796), the fourth of the twelve children of Pierre Hache, is the best known of this dynasty of ébénistes. 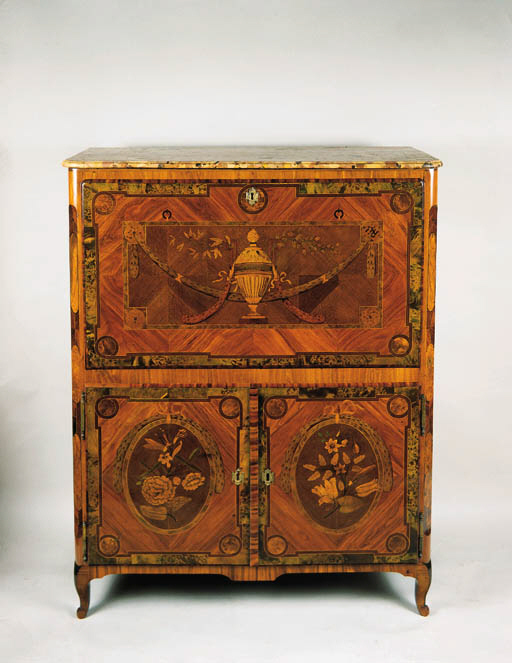 Starting in his father's workshop, he set up on his own around 1754, producing both luxury and everday items of furniture. The trade label fixed on this piece corresponds to that documented by R. Fontvieille, op cit, as No. 7 out of the thirteen different labels used at different dates by this maker. He used this label in both 1771 and 1772. Please note this secretaire will be included in a forthcoming book about the Hache family being published by Pierre Rouge.